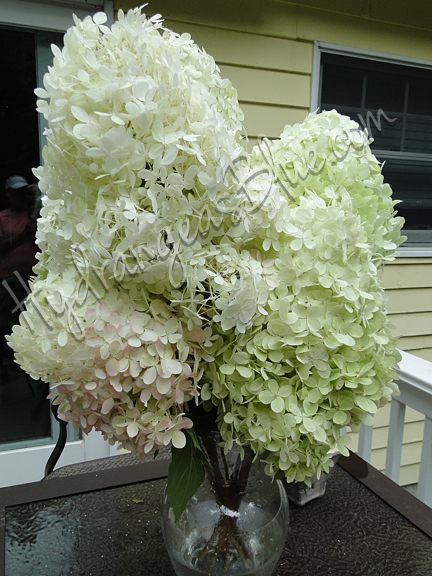 One hydrangea that has cone-shaped, panicled flowers is the limelight variety. 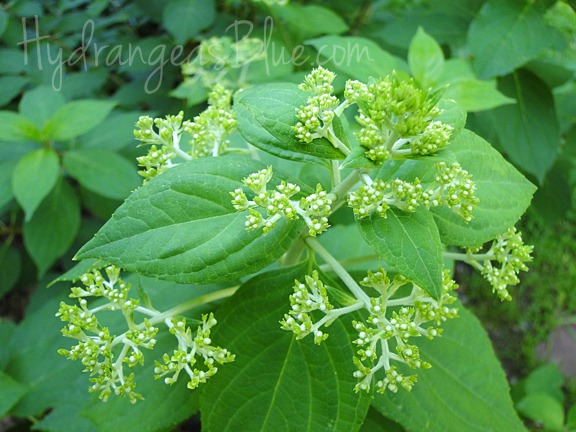 I’m using my own photos on this post to show the stages of the limelight hydrangea flower, as it grows from spring through the fall season. All pictures on this page were taken from the same flowering shrubs in my front yard, but throughout their growth period. 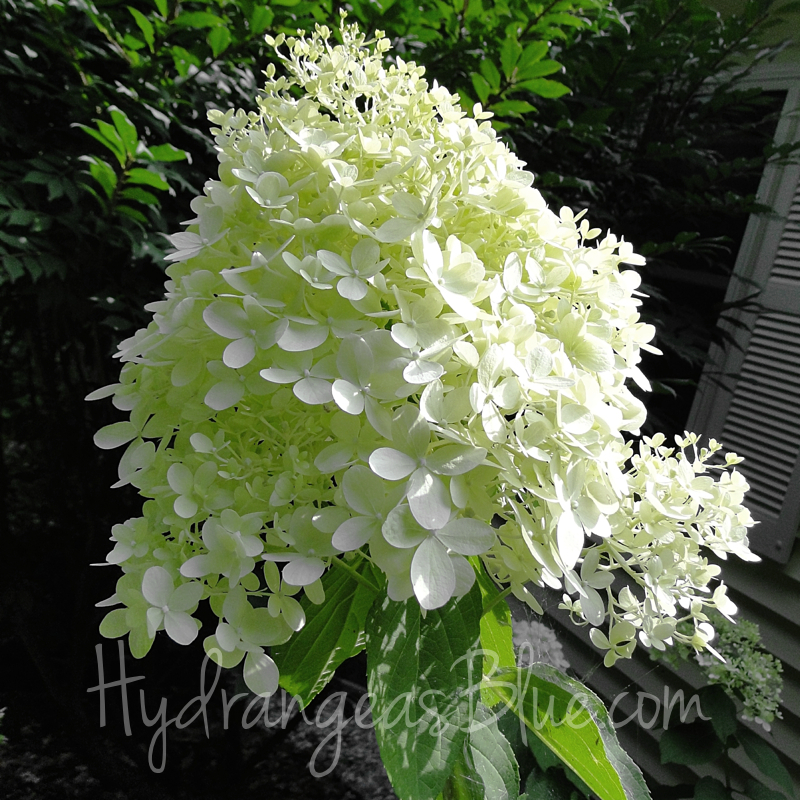 Hydrangeas can produce some of the most spectacular light green flowers, and the limelight does not disappoint. Brides love this flower to accent any wedding theme, and it’s often chosen to create stunning centerpieces. In spring, this perennial sends out tall stems. Eventually buds form, with many little clusters of flowers shooting out along the end of the branch. This is the panicle, which makes this a hydrangea paniculata. These tiny clusters will each grow and merge to form a resulting, huge single bloom. The flowers are the greenest when they are first growing. The buds open from the bottom to the top, creating a flower that is a combination of soft white to light green. My limelight shrubs are fairly new to the yard. They were planted in 2012, and I am still learning about how to prune and grow them successfully. Fortunately hydrangeas are very hardy, and even if you do something ‘wrong’ they will continue to grow nicely. Once the blooms fill out they are mostly white, and big and puffy looking. This hydrangea creates some of the most stunning blooms you’ll ever see. As summer passes, the white flowers begin to turn pale pink and become darker during the autumn months. They can be cut to use in an inside arrangement, or left to dry on the bush (see my last photo on this page). 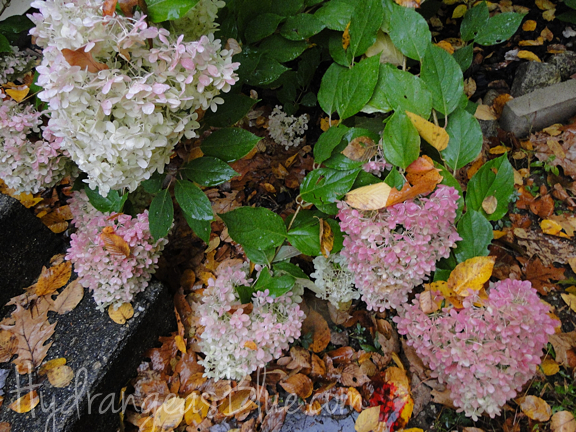 My photos above and below show the pink-tinted hydrangea flowers as they appear in the fall season. The flowers are massive, and the petals that were once a creamy white are now turning partially pale green and mauve pink. My plants are fairly young. As the plants age, the stems will fill in and become stronger. I’ve seen them staked to hold the flowers upright, as they are heavy and tend to flop downward. 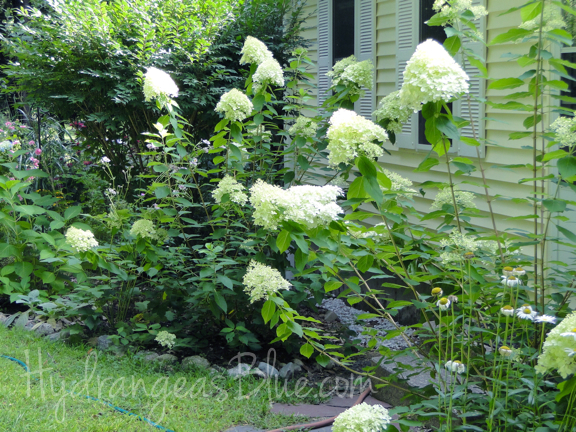 The Limelight hydrangea can be pruned into a little tree, but that takes skill and patience. 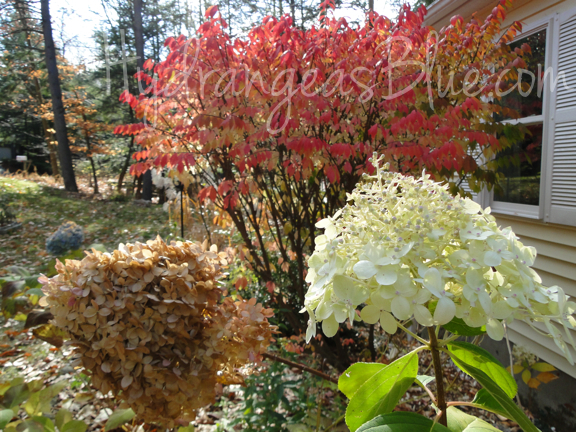 I have never tried to create a hydrangea tree, but they are stunning accents to any landscape. The flowers hold up well into fall and become dried garden decor. Hydrangeas are fun to grow. You just never know what they may do, like pop out a new bloom in October! When all the other flower heads were dried and brown, suddenly a new white flower emerged from my Limelight (photo above). I hope you have enjoyed my photos, and maybe I have inspired you to grown one (or more) of these lovely hydrangea shrubs. Now, would you like to see the stages of the Pinky Winky blooms?